Since having a child, I’ve found myself eating more foods from my childhood than I ever thought I would. Peanut butter sandwiches now with fig jam. Grilled cheese sandwiches updated with romesco and avocado. And pasta by way of this roasted butter tomato sauce. You’re never too old for your favorite childhood meals. 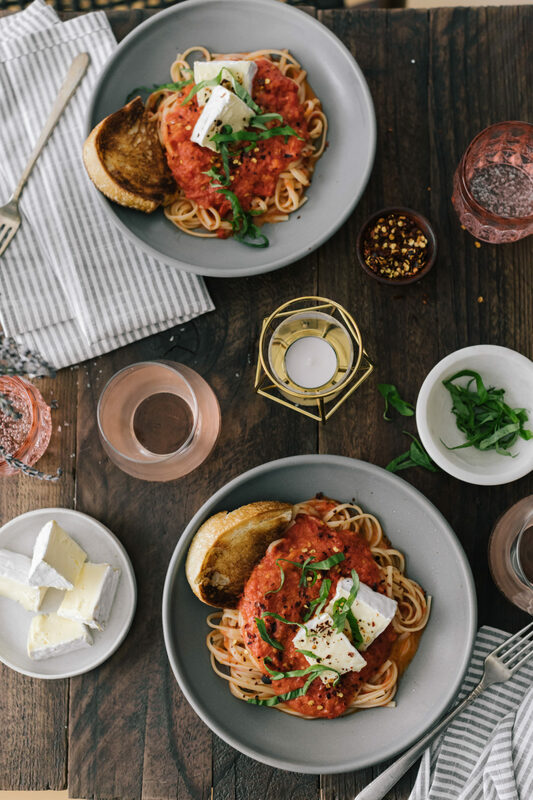 This roasted butter tomato sauce is a riff on the famous Marcella Hazan recipe that uses canned tomatoes with onion and butter. Since we’re overflowing with tomatoes right now, I decided to slow-roast roma tomatoes in Président butter and garlic. 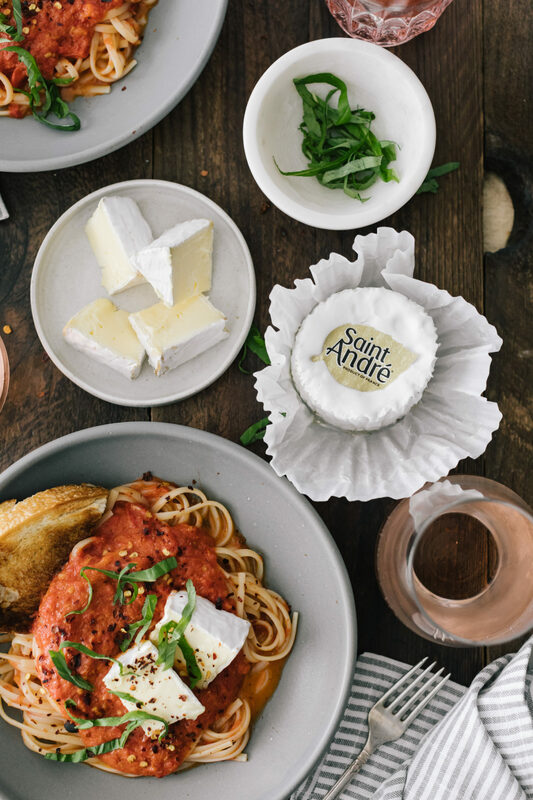 Add a pinch of salt and the melty wedge of Saint Andre cheese for the perfect summer sauce. Also, you might notice a heavy French presence in this recipe. For this recipe, I’m partnering with the French Ministry of Agriculture to bring a little French culture home. 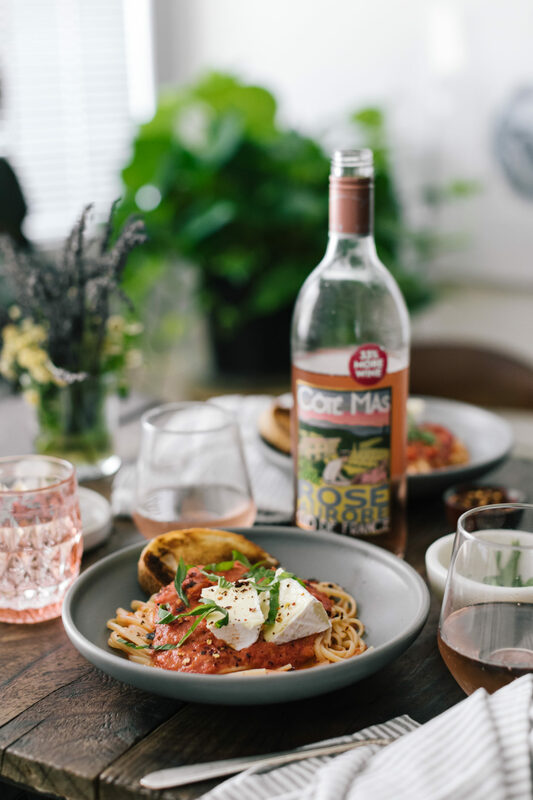 What better way to enjoy dinner than with a little French influence (and french wine- especially this Côté Mas Rosé Aurore). The slight fruit flavor of this rosé is the perfect crisp balance for the pasta. Alliums: Swap out the garlic for shallots or white onions. Pizza: This tomato sauce is amazing as a base for pizza. One note, the sauce can be a bit thin- reserve some of the tomato liquid before pureeing if you would like a thicker sauce. Vegetables: If I have any zucchini, I’ll often pan fry that and add it to the pasta. An updated classic, this tomato sauce is made from fresh summer tomatoes roasted in butter and garlic. Better yet, it’s served with a wedge of creamy cheese for a perfect pasta sauce. Heat your oven to 325˚F. Slice the roma tomatoes in half. Place cut side down in a roasting pan along with the butter, cut into pieces, and the peeled garlic cloves. Add the salt and pepper then place the roasting pan in the oven. Roast, stirring occasionally, until the tomatoes are tender; 1 to 1 ½ hours. Once the tomatoes are almost done, cook the pasta until al dente. Drain and toss with a tablespoon of butter. Remove the tomatoes from the oven and pulse to puree into a chunky sauce. Taste and add more salt as desired. Toss with the pasta. Serve with a sprinkle of basil and a slice or two of the St. Andre cheese. 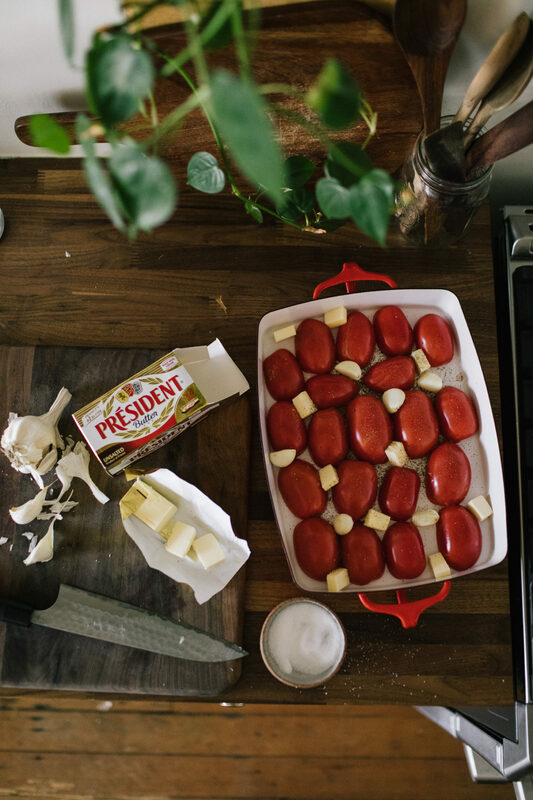 Tips + Tricks: For a thicker sauce, drain off and reserve any extra butter/tomato liquid. Add back in to reach a desired consistency. 6 Real Life Superhero Origin Stories from Our Community!